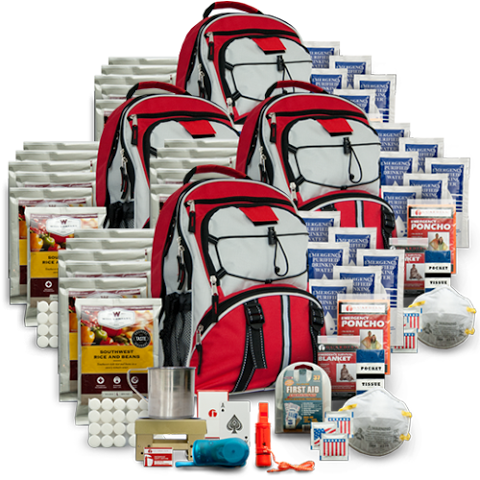 EACH BACKPACK CONTAINS THE FOLLOWING ITEMS: 32 SERVINGS OF GOURMET ENTRÉES (Including Apple Cinnamon Cereal, Brown Sugar Cereal, Creamy Pasta, Southwest Beans and Rice, Rice Pilaf, and Whey Milk), 5 X 4.227 FL. OZ. WATER POUCHES, PORTABLE STOVE (Including 24 Fuel Tablets), STAINLESS STEEL CUP, SQUEEZE FLASHLIGHT, 5-IN-1 SURVIVAL WHISTLE, 42 PIECE FIRST AID AND HYGIENE KIT (Including 37 Piece Bandage Kit, N95 Dust Mask, Pocket Tissues, 3 Wet Naps and Waste Bag), WATERPROOF MATCHES, MYLAR BLANKET, EMERGENCY PONCHO, PLAYING CARDS.